A remedy of first choice for Autoimmune disorders of all kinds. Please refer to the Autoimmune Protocol for recommendations and further information. The ratio of the sterols to their sterolins is exactly as it is in nature. Each capsule contains 40 mg of sterols with 8 mg of sterolins. Organically grown Wild African Potato Root, Lupine Sprouts, Fenugreek Sprouts, Barley Sprouts, Pygeum Africanum, Soybean Sprouts & African Sunflower Sprouts. The whole plant sprouts are ground & freeze-dried immediately after harvesting. All nutrients are retained. They contain vitamins, minerals, specialized enzymes & other phytonutrients in addition to Sterols & Sterolins. The T cells can more effectively help to eliminate virus, bacteria, and fungal infections and calm, reduce, or eliminate the over-production of B cells that attack the bodies own cells and consequently help reduce most chronic disease, especially the auto-immune disorders. Help produce DHEA and therefore many other hormones required for health. As the result of all the above help promote and longer and healthier life. Capsules contain organically grown Wild African Potato Root, Lupine Sprouts, Fenugreek Sprouts, Barley Sprouts, Pygeum Africanum, Soybean Sprouts & African Sunflower Sprouts. The whole plant sprouts are used which have been ground & freeze-dried immediately after harvesting. All nutrients are retained. They contain vitamins, minerals, specialized enzymes & other phyto-nutrients in addition to Sterols and Sterolins. The ratio of the sterols to their sterolins is about 5:1 – exactly as it is in nature. Each capsule contains 40 mg of sterols with 8 mg of sterolins. Plant sterols and sterolins are potent immune modulators capable of reversing abnormalities of the immune system. Sterols combined with Sterolins have been shown to provide nutritional support for the symptoms of benign prostatic hypertrophy (BPH), rheumatoid arthritis, autoimmune diseases, chronic fatigue syndrome, lupus, migraines, menopausal symptoms and for cholesterol balance. If you have an auto-immune disorder or compromised immune system, and are pregnant or suffer from high blood pressure, then Natur-Leaf (plant sterols and sterolins) should be considered essential. Other remedies are usually prioritised where neither high blood pressure or pregnancy are a factor. To provide the best relief of auto immune disorders; please refer to the article here for recommendations and further information. Liquorice and Immuno-Calm (which contains liquorice) also have naturally occurring Sterols & Sterolins. Why Do We Need Phyto Sterols and Sterolins in Supplement Form? Just eating more fruits, vegetables and seeds will not address our chronic deficiency. Because sterolins are dissipated within 8 hours after harvesting, our foods today have little or no sterolin (glucoside) content left in them. Even organic store produce is usually out of the ground for longer than 8 hours. Tragically, modern food processing techniques remove sterols and sterolins from most foods in an effort to improve the appearance or shelf life of the products. Our home food preparation techniques such as freezing and boiling also wipe out these beneficial substances. Lastly, because in their natural state, sterols and sterolins are hard to digest even with perfectly functioning digestive systems, we need supplementation in a highly absorbable form to get the true benefit of these remarkable plant fats. Sterols and Sterolins are also useful for general health maintenance, to keep a balanced immune system, detoxify the system and help to prevent disease. 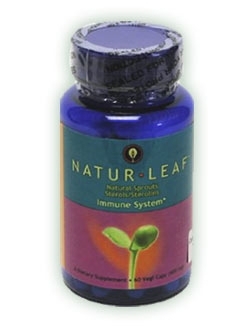 Natur-Leaf has anti-inflammatory effects, help to balance the hormones, support cellular health and more. Normal health maintenance: 2 capsules daily. Therapeutic dosage for illness 6-9 capsules daily, for up to 12 weeks or as advised by your therapist. Plant (phyto) sterols and sterolins are plant "fats" present in all fruits and vegetables. They are biologically active molecules isolated from plants; there is clinical proof that they significantly modulate the effects of the immune system. Without sterols/sterolins, the immune system may become too stressed to produce enough invader fighting T-cells or may overproduce the cells responsible for the autoimmune response. To date, the plant fatty acids/lipids, sterols/sterolins, have been found to be helpful in cases of autoimmune diseases. Phytosterols/Sterolins modulate the function of T-cells. T-cells are white blood cells produced by the Thymus gland that specialize in fighting viruses and certain bacteria living inside the cells. Researchers are convinced that Phytosterols/Sterolins enhance T-cell function*. One type of T-cell, the Helper Cell, excretes proteins that regulate the immune system. Helper cells are divided into two types, Type TH-1 and Type TH- 2. These cells must remain in a delicate balance at all times for the body to remain healthy. An immune system that is not functioning properly is low in T-cells and other chemicals. When the TH-1 cells are deficient, infection, chronic inflammation and ultimately tissue damaging disease may result. "In over 133 double-blind clinical studies to date, sterols/sterolins have been shown to significantly enhance the proliferation of the CD-4 TH-1 cells and to increase the production of the "lymphokines" Interleukin 2 (IL2) and Gamma-interferon." Our body's immune system is like a production line in a factory. Every step in the process is dependent on every other step. Illness, viruses and infections (including candida) create an imbalance by suppressing our TH-1 cells. (Also many other factors such as nutritional deficiencies, immunization, electro-magnetic stress, environmental toxins and so on). TH-1 cells control the TH-2 (Type 2 Helper) cells release of chemicals (IL4, IL6 and IL10) that enhance the activity of B-cells. B-cells produce antibodies that attack invaders outside the cell walls. Therefore, a drastic reduction of the TH-1 immune chemicals (lymphokines) will allow the TH-2 cells to over produce their chemicals that will, in turn, create too many B-cells or antibodies. Too many antibodies can cause an autoimmune reaction. Uncontrolled over activity of B-cells is thought to be responsible for debilitating or chronic autoimmune disorders such as Rheumatoid Arthritis, Lupus, Multiple Sclerosis (MS) and Myasthenia Gravis (MG) and many others as listed in the autoimmune protocol linked above. Even many allergies and asthma may have an autoimmune response factor. Studies show response by patients with a number of immune dysfunctions including Chronic Fatigue Syndrome, MS, and Diabetes. Anecdotal reports as well as some on-going studies indicate Phytosterols/Sterolins also benefit those suffering from allergies, viruses, fibromyalgia, tumours and BPH, lupus, TB, psoriasis, rheumatoid arthritis. We refer you to the article "Rheumatoid Arthritis And Sterols/Sterolins". This Article helps in understanding the importance and action of sterols/sterolins in the alleviation of all auto-immune disorders, even though the core of the discussion is centered on Rheumatoid Arthritis. Phytosterols and Sterolins may block the development of tumours in colon, breast and prostate glands by altering cell membrane transfer in tumour growth. Studies indicate after 5 days, breast cancer cell cultures supplemented with b-sitosterol had 66% fewer breast cancer cells than controls. Another study showed a 28% inhibition of prostate-cancer cell growth after being exposed to B-sitosterol for five days in vitro. "When we treated prostate-cancer cells with phytosterols, cell proliferation was inhibited. We found the same effect in vitro with breast and colon-cancer cells". Press Release: University at Buffalo Press, State University of New York, 4/29/99 (breast) and 10/25/98 (prostate). Generally it is thought that a low immune system is one of the pre-requisites for the development of cancer. By enhancing the function of both T cells and the secretion of lymphokines. The immune system will stand a better chance of eliminating cancer cells. Phytosterols/Sterolins have been shown effective in carrying out anti-inflammatory activity at sites where chronic inflammation is present. By blocking the abnormal production of the inflammatory proteins, plant fats can inhibit inflammatory conditions. They decrease the blood levels of Cortisol. Studies show significant reduction of inflammation in Rheumatoid Arthritis sufferers. Trials are continuing on RA. In these conditions, the lymphokines secreted by the T cells promote the B cells to make a certain type of antibodies (IgE). Because the sterols/sterolins mixture stimulate the secretion of "good" lymphokines which inhibit the IgE promoting lymphokines, the symptoms of an allergic state would disappear. Phyto (plant) Sterols and sterolins are found in many foods, but due to processing, cooking, rapid loss of, and difficulty in absorption, may be regarded as being almost universally deficient in the modern diet. Supplemental Phytosterols and sterolins have been found to be completely non-toxic. Dr. Joseph Pizzorono and Dr. Michael T. Murray of John Bastyr College in Seattle are enthusiastic about the use of plant-based sterols as opposed to conventional drug estrogens for hormone replacement. The PhytoSterols/Sterolins have absolutely no side effects and can help balance the oestrogen dominance occurring in females of all ages. John Lee, a leading researcher into women's health issues, states: "Phyto-hormones are gentle compounds which can be substituted for the body's estrogens. They tend to protect a woman from the xenoestrogens (pesticides and herbicides that occupy the same receptor sites as natural oestrogen) doing damage. I consider them a very benign and helpful source of hormones. "Sterols and Sterolins, Natural, Nontoxic Immunomodulators and Their Role in the Control of Rheumatoid Arthritis", article by Prof. Bouic, Townsend Letter for Doctors and Patients, Aug/Sep 1999.